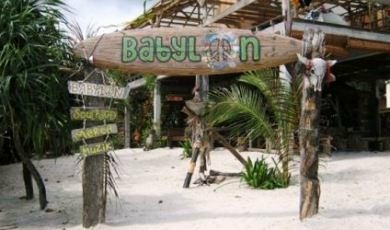 Babylon is a beach bar located in Pantai Cenang and has made a great name for itself. Other than a spread out bar on the beach, there is a live band playing reggae in the evenings. So some call it a Reggae Bar. But it has its own profile of clientele. If you are looking for a sophisticated dining experience with music by the seaside, then this is not the place for you. This 1 acre ocean front place draws a lot of young crowd as well as foreign tourists who look for casual, natural and friendly ambience. As the name suggest, you will literally need to pull your own mat on the sand and sit on that. There will be small tables next to you to keep your glasses & plates. You can also sit on chairs. The chairs, tables, the stalls and even the stage for the live musical performance are all built using driftwood and other natural recycled substances. The whole place looks like a rustic village setup. Don't be surprised if you see couple of goats roaming about. That's part of the ambience created by the owners. They believe in nature friendly green & recycle policies. So how can you enjoy your time here? Although they serve both lunch and dinner, Babylon actually comes alive after sunset. This is when the live band starts playing music (mostly reggae) and often there is a jam session. So it can get a bit noisy at times, but not so much that you will need to shout to let your partner hear what you are saying. They invite bands from different places, mostly amateur but good groups. They come and show their talents here. So while having a beer (which is very reasonably priced), you can get immersed in music, and at the same time hear the waves pounding just below your feet while sitting on the sand. Awesome isn't it. We love it. Every time we are in the island, we would spend at least one evening at Babylon. The food is good too. The homemade burgers are great, huge and one of the best in the island (3 layers of meat!!). They also serve a range of seafood. Local fares like Roti Canai is also great. There is a barbecue & snack stall as well. Takeaway service is also available. What else will you find here? Lots of trees and greenery. If you go around you will find several stalls selling food, clothes and other local products. Several junked cars that have been colorfully painted to fit with the ambience. So over all a laid back atmosphere. Take your time and relax, that's the theme. The staffs here are also very friendly and in no mood to rush you. Well, if there is one thing you wish could improve here, it's the toilets. Well as I said, this place is not meant for everyone. If you are too finicky about precision and cleanliness, then you may try another place instead of spending the evening here. Sometimes Babylon holds art & culture events in its premises like a music festival. Performers come from neighboring countries like Indonesia, Thailand and even Australia. Of course many local talents too participate. Many vendors put up food stalls offering authentic local fares. Their sister bar Warung is located on the road side, which too has a village hut like appearance with slanted straw ceiling. Update Jan 2013: Babylon Mat Lounge is now offering 2 hours Hatha Yoga classes everyday from Monday through Saturday. Contact the bar for timings and other details. Casual. You will find most tourists coming here wearing shorts and T-shirts. Some even on beach wears. Daily from 10am to 2am. You can walk in. No reservation is required, although they do take reservations and table bookings as well. Overall great for young crowd, music lovers and even families. Update May 2014: Sadly Babylon Mat Lounge has closed down in Pantai Cenang. But the good news is that they have re-opened in Pantai Tengah next to the restaurant Mangga. They don't yet serve any food at the new place. You can bring your own beer and listen to the music (reggae). Food is available at Restaurant Mangga.